Toronto Dingos full forward Wade Edwards has broken the club record for most goals kicked in a season against Guelph on Saturday. Edwards’ six-goal haul took him to 58 for the year, overtaking Josh Dray’s 57-goal season in 2000, the year the Dingos won their first flag. The club record catapults Edwards to fourth on the all-time club goal kicker’s list, behind Craig Stewart (361), Chris Buczkowski (242), Paul Tinkler (218). Edwards has played all 11 games this season and with one more round remaining, plus finals, there could be more goals to add to his list. 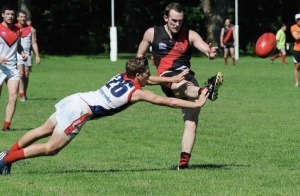 In 2015, Edwards has averaged five goals per match with the highest coming against the High Park Demons in round four with 12 goals. The forward has kicked five or more goals in seven out of the 11 matches this season and has kicked 26 goals in his past five outings. Congratulations Big Wade on a record-breaking season so far! The club is very proud of your huge effort.